If the children are happy, then so are the parents. 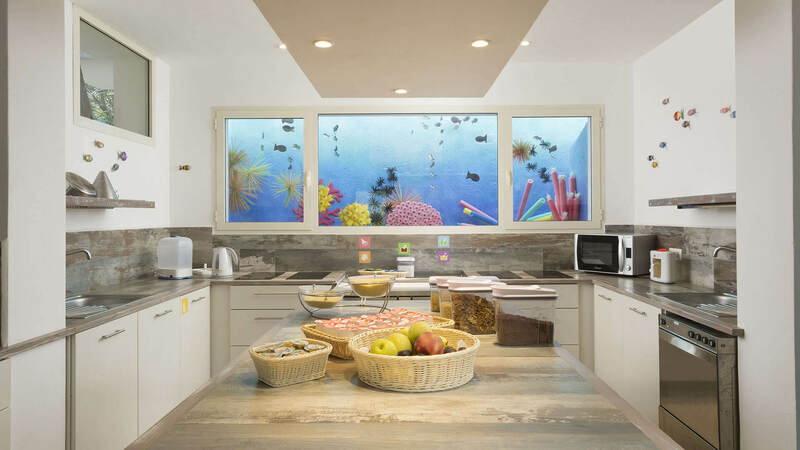 A family holiday with children at the Resort & SPA Le Dune is a chance for the youngest to have fun and games at the Baby, Mini and Junior Clubs. Teenagers will have the chance to make new friends and enjoy themselves at our Teen Club which is open to all young people up to 17 years old. A staff of assistants is on hand for everyone and which is dedicated to helping our guests enjoy their free time six days a week, with sports and activities suitable for all ages. There are always new and entertaining ways to enjoy your holiday, such as the many sports courses, games, acting courses, enthralling shows that will stimulate the creativity of the youngest guests and make their holiday unforgettable. For the older guests there are educational activities and imaginative theme parties in the Junior and Teen Clubs. Open and covered spaces dedicated to them, together with children sized swimming pools have all gone to make sure that leading European tour operators have praised Delphina for the attention paid to its smallest guests. Fully equipped complete with high chairs, sterilizers, bottle warmers, changing tables and everything else necessary for mothers to feed their children as well as a supply of biscuits, yoghurt, milk, water and fruit juice, vegetable soups and broths. This is the castle for the youngest guests with creative workshops, padded play spaces, the “Pisolo” relaxation area equipped with cots, a cinema for watching films and the chance to eat in the Peter Pan restaurant reserved exclusively for our smallest guests. This is a world for children, but also for families with numerous facilities developed to answer their needs, including the nursery and a fully equipped bottle-feeding area. An educational journey to discover nature and learn while playing. 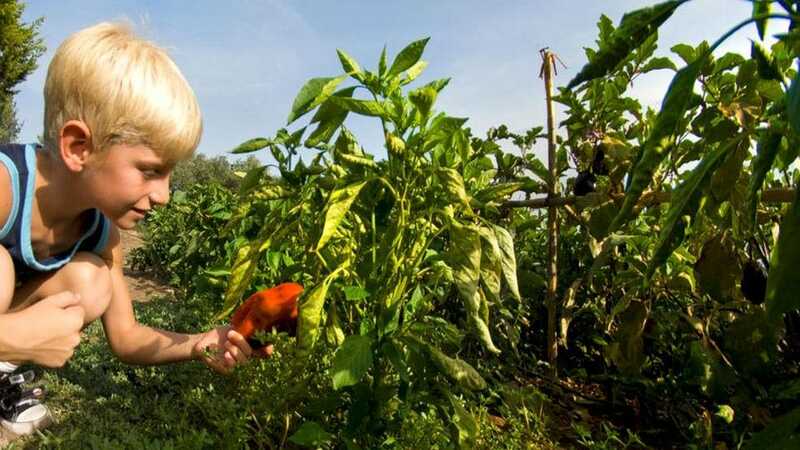 At the Peperone organic vegetable garden children can discover Mediterranean plants through watching them and looking after the different stages of their growth from seed to fruit, culminating in harvesting the vegetables that are then eaten in the Peter Pan restaurant. At “Puddaggiju”, the vast aviary, children can look at the many-coloured peacocks, the ducks, and watch the growth of the chicks as well as collect the freshly-laid eggs from our free-range hens. At the heart of the resort, a large area dedicated to childrens games plays host to an inflatable pirate ship with slide, climbing games and a jumping area where fun is guaranteed, a Fantacastello with helterskelterand even a climbing wall complete with protective equipment so children can have incredible adventures in complete safety, and all under the supervision of qualified staff. 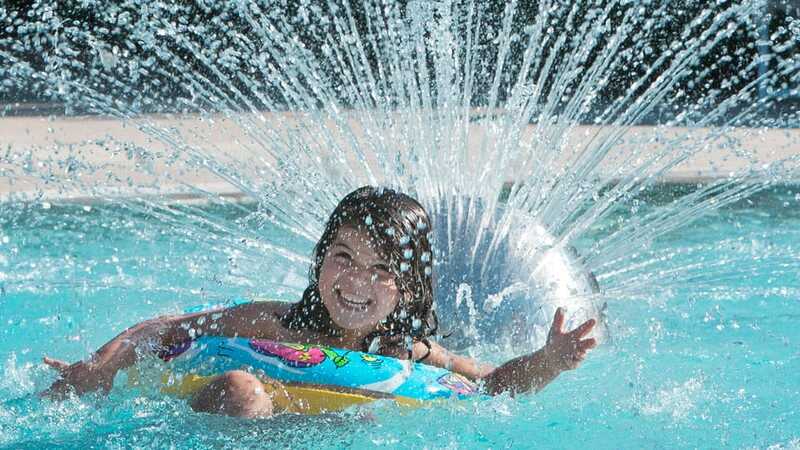 A short distance away is a childrens pool and water games area. 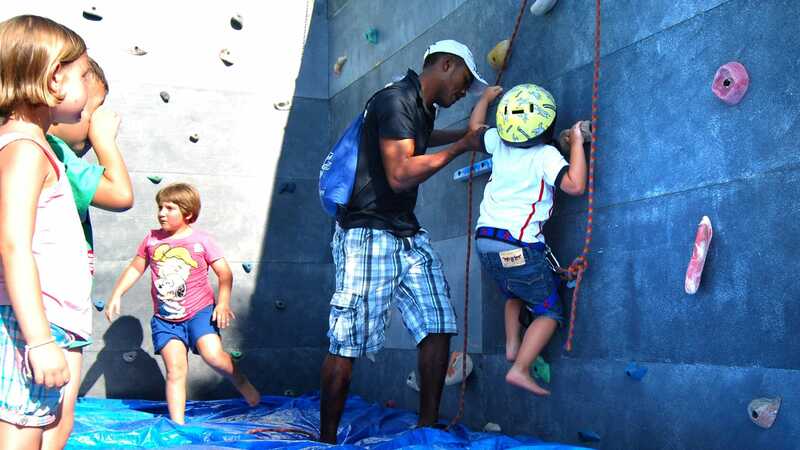 The Resort Le Dune playground has a climbing wall equipped just for children. This is a great way to learn a better sense of balance and awareness of movements while playing and of course, always accompanied by experienced instructors . 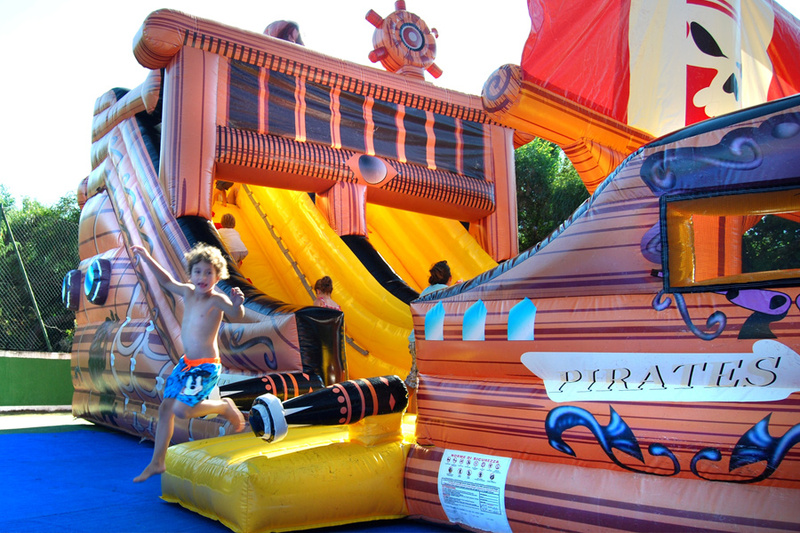 This huge inflatable in the shape of a giant pirate ship is one of the favourite games for children on holiday in the Resort Le Dune. Slides, rudders, cannons … everything is soft and padded and they can jump around and have fun in complete safety. 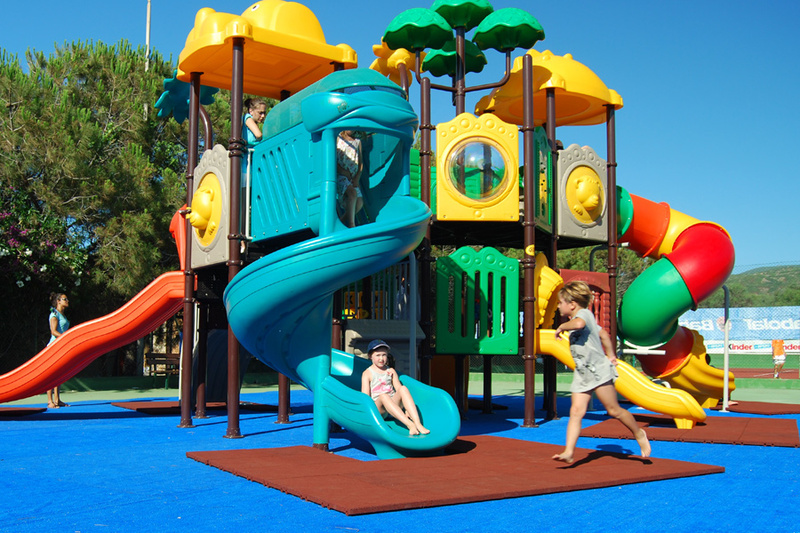 The Villaggio Fantasia is a genuine fully equipped play area of about 10,000 m2 surrounded by nature, with a children sized swimming pool, but also a Red Indian camp and “Fort Krock”, the cowboys fort where they can come up with new and entertaining games to stimulate their imagination. Imagine being a cowboy, a sheriff or the most dangerous bandit in the Wild West: anything can happen when children play using their imagination! An open space set in greenery amidst juniper trees and typical Mediterranean plants. 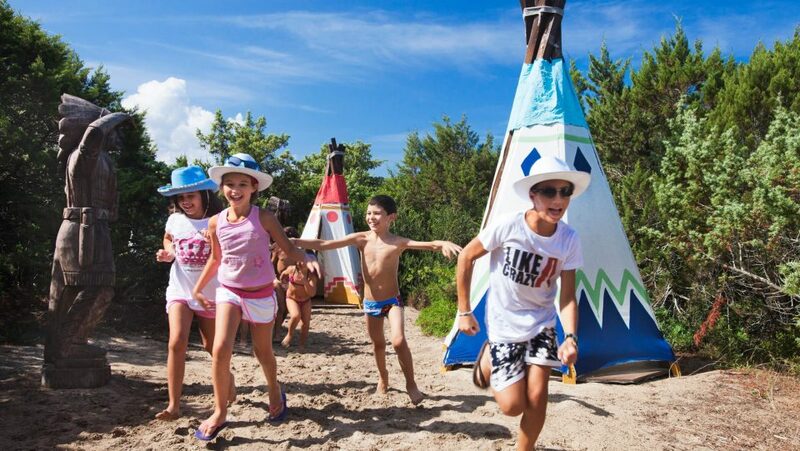 Brightly coloured tents, totem poles and games that will catapult kids into a genuine Indian camp, a place to live adventure-filled days in contact with Sardinia’s pristine and unspoilt nature. Inside the Villaggio Fantasia there is a child-friendly pool where thanks to the depth of the water the youngest guests can jump and dive in complete safety and splash and play with Mum and Dad in complete freedom. Restaurant area with spacious veranda for the smallest guests of the Baby and Mini Club, open every day for lunch and dinner for them to stay close to new friends (excluding Saturday). 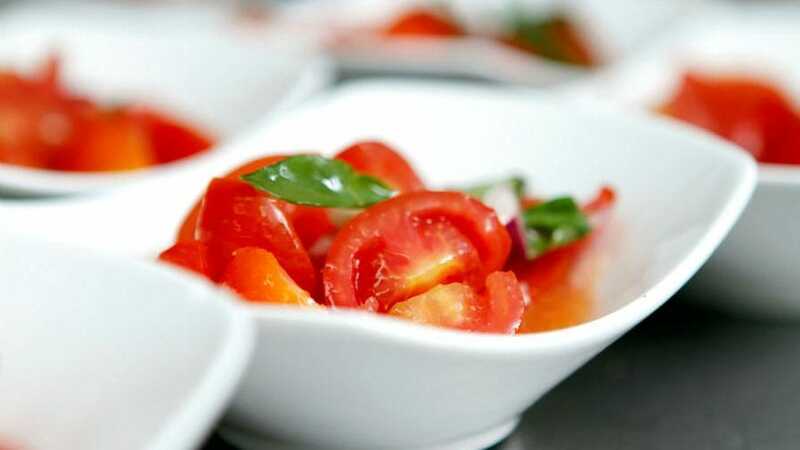 Authentic cooking, organic or zero km food: vegetables and eggs come straight from the resort, collected by the children in the Peperone Organic vegetable garden and the Puddaggjiu, our own aviary. For the Peter Pan baby restaurant the presence of one parent for children up to 2 years old is obligatory. From 2 to 3 years old. Free group child-minding service from 09.30 to 18.30. From 20.30 to 22.30 with booking and payment on site. For access to the Baby Club a medical certificate is required stating that the child is “free from contagious and infectious diseases” issued no more than three days prior to arrival. From 4 to 8 years old, with free group child-minding service and open from 09.30 to 18.30. A variety of recreational activities and the option of entrusting your children to our entertainment staff either for lunch or dinner at the Peter Pan restaurant (open every day, except Saturday). The fun continues after dinner with the Baby Dance: entertaining dances for children to go wild together with Delphina, the resort’s adorable mascot. From 9 to 13 years old with free group childminding service and open from 09.30 to 18.30, offering a variety of educational and sports activities and a themed evening party once a week with professional entertainers (necessary to sign up beforehand). Designed to satisfy the needs of adolescents from 14 to 17 years old, the Teen Club is an area where no parents are allowed where young people can make friends and have fun with people of the same age in complete safety. Fashionable non-alcoholic Happy Hour and nice evenings in a great atmosphere. Various sports and free time activities with free archery, five-a-side football, beach volleyball, mini basketball, tennis and all other scheduled activities.